This is what I posted on change.org today as an update to the 11,000 people that supported the notion of a new “institution” (only unlike anything you have come across before). 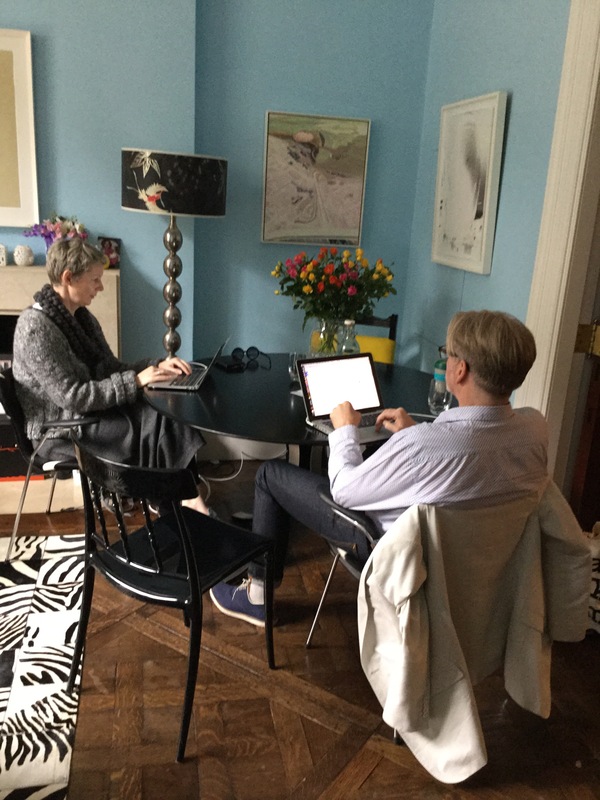 We are in full launch mode – in my dining room! But this is where it starts… I can’t wait. ” When you kindly stayed up to watch my Dimbleby lecture I wasn’t sure if the idea of a new public organisation for the digital age would gain momentum. It has. We are now in full start up mode and aim to launch in November with projects already underway before then. This success is in large part due to YOU. Thank you. Now we need your continued support to make sure the organisation is the best it can be. There is a huge opportunity for the UK to lead the world in how we think about creating wider public value from the extraordinary dominance of the Internet. Doteveryone (.E) will champion the non-commercial, universal aspects of the Internet. We are starting as we mean to go on. No grand office, no big teams. A small number of committed people running projects with clear achievable aims and relatively short timeframes. We are are open and collaborative by default which is why we have published the short document we have used to raise money on our new blog doteveryone.org.uk. Please check it out, get involved and give us feedback. I have read your Dimbleby Lecture with interest and whole heartedly support the objective. I am a retired RAF Navigator who, on leaving the Air Force joined Ferranti Computer Systems, leading a small team bidding for MOD contracts for Intelligence Support Systems, a field that was new for Ferranti and one that I had experience in as I had two appointments in Intelligence before I left the RAF in 1988, plus I was also the Project Officer for a new Intelligence system that was planned for Strike Command Headquarters at High Wycombe at that time. When I retired fully in 1999, I made use of my experience of both analogue and digital computers in the RAF to teach Basic Computer Skills (BSC) at Wokingham Library – Berkshire – in a team led by the retired Chief Librarian until we were ousted by Learn Direct, who were moved from much larger premises in Bracknell when the Government reduced the Adult Education budget, however they did not want any competition from us at Wokingham Library! I then managed to find a position as a volunteer trainer at the Age Concern Day Centre at nearby Woodley teaching BSC to silver-surfers on Windows XP PCs, where I continued until everybody wanted to be taught the iPad! During this period I also joined Wokingham U3A and bought myself an Apple iMac, followed by a Mini iPad and iPhone, and also managed with my U3A computer literate colleagues to hold several sessions getting members of the public online using the Computer Room at a local school. I also placed a short note in the Wokingham U3A Newsletter saying: Is your new computer the Apple of your eye!? And immediately got 26 people interested in becoming members of 4 new U3A Apple Groups – one Apple iMac/Laptop group and 3 Apple iPad groups – which are still going strong. I won’t bore you further with my life story but just wanted to convince you that I am wholly committed to getting as many people as possible online because I too believe that ‘DotEveryone’ is the answer. Also, does the ‘Internet of Things’ fit into ‘DotEveryone’? Finally, I am a great admirer of your work as the Governments Digital Champion – and your courage! I do hope that DotEveryone takes off and the Government realise its potential not only for the National economy but for the well being of our country.